LG got impatient about Mobile World Congress happening in ten days time and thought to announce their newest 2014 flagship today. The 5.9 inch phablet is the followup to 2013’s LG G Pro. This comes after they dropped the Optimus naming and run away with the shorter “G” for their flagship devices. The G Pro 2 is not far off from what we have seen so far and the new things the device possesses that we haven’t seen so far in devices include Knock Code which is an evolution of Knock On that allows the user to wake the smartphone from lock screen with double taps. LG goes further and adds combinations of taps from between 2 to 8 taps each with a set of responses. Location of the knocks also yield different responses in what LG calls 86,367 knock combinations. 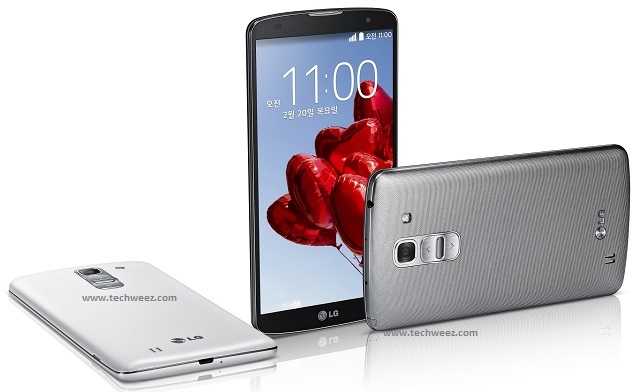 Beyond that, LG put in Optical Image Stabilisation (OIS) on a 13MP camera, a first within LG circles. Other features include “magic focus” that’s said to allow a user select preferred depth focus on an alreaty taken photo before saving. Another, still on the camera is Natural flash that harmonizes the colour of the flash with the background bringing out a balanced colour temperature. There is also a Flash for Selfie feature that reduces the size of the preview screen and adds a bright white background for more “soft” lighting in self-portrait mode. The G Pro 2 was announced for the Korean market with no specifics on outside the home country borders.